The most hospitable people, the sweetest melon, the delicious national cuisine, the magnificent beauty of nature – all this is Uzbekistan. LLC “Elite tours” offers you a wonderful opportunity to make an unforgettable trip to Uzbekistan at a bargain price, enjoy a wonderful holiday, and get new vivid impressions. Most tourists come to Uzbekistan for architectural monuments, built hundreds and even thousands of years ago and perfectly preserved to our days. Decorated with unique ornaments, they have no analogues and invariably cause admiration. The cities of Samarkand, Bukhara, Khiva, Tashkent, Urgench, Margilan, are widely known all over the world. Here you can feel all the splendor of the East, feel what a real exotic. 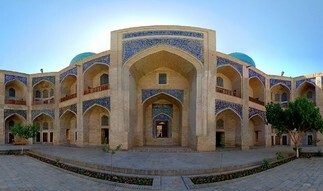 A pleasant surprise for the guests of the country is that the cities of Uzbekistan today acquired a modern look – the new buildings combine modern technologies and elements of national architecture. Going on a trip to Uzbekistan separately, you need to focus on the capital city of Tashkent. Megapolis boasts hotels for all tastes, historical sights such as Kukeldash Madrassah, Khast Imam Complex. No one will be indifferent to the modern facilities-the Tashkent TV Tower (height – 375 meters), the National Library of Amateurs of outdoor activities will enjoy the picturesque mountain landscapes, in particular, the mountain peak of Big Chimgan with a height of 3309 meters above sea level. Crystal clear air, seclusion from the extraordinary beauty of nature, rest from noisy cities, civilization – all this can be found in Zaaminsky national park. You will be amazed by the beautiful juniper forests spread over the mountain ranges, the most delicious spring water, which has medicinal properties, the diversity of flora and fauna, some of which are very rare and listed in the Red Book of Uzbekistan. Mysterious Uzbekistan opens its doors to you, and LLC “Elite tours” will help make the trip as comfortable and unforgettable as possible.